A baseball game for the GameCube starring Mario and friends. 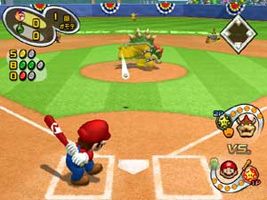 Bowser and Bowser Jr. have taken over all the baseball fields in the Mushroom Kingdom, so Mario and a group of other team captains come together to beat them at baseball. Each team is made up of a team captain, several main characters and the rest of the team is made up of sub-characters. After beating a team in the main game you can recruit new members and change your lineup. There are many other modes and minigames to play, including the Toy Field where players take turns to bat based on who caught the ball.